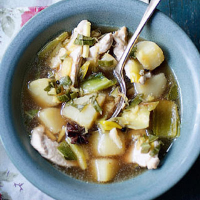 A new take on a hearty autumnal soup. Heat the oil on a medium heat in a large pan and cook the leeks for 8 minutes, or until soft. Turn the heat up a little, add the garlic and potatoes, and cook for 2 minutes. Cut the chicken into 2cm strips and add to the pan with the stock and star anise. Bring to the boil and cook for 15 minutes, until the potatoes are soft and chicken cooked through. Stir in the sage and ginger, then season.